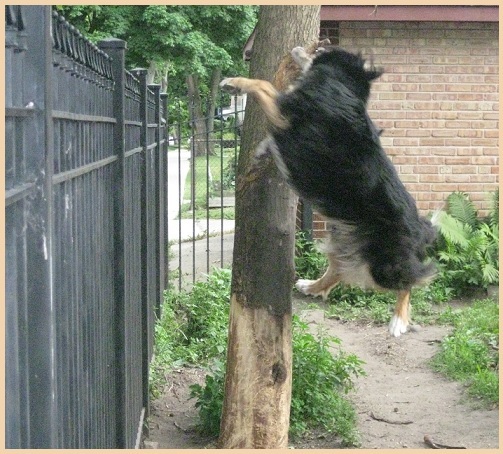 2015-06-18 – My dog Lefty gnaws on trees. I am not kidding. In his youth he gnawed the bark off one tree in our backyard from the ground up to six feet off the ground. I don’t normally illustrate my blog posts, but this is so astounding that today’s picture is offered as proof. That’s Lefty in mid-air taking a chomp on the tree. For comparison, the fence is six feet high. The path beneath was worn by his approach to the tree, repeated relentlessly. We don’t leave Lefty in the backyard anymore. The grass and foliage have mostly grown back. But not the tree. It stands even to this day, leafless, as a stark reminder of the ferocity of nature. Little did we know when we brought Lefty home from Canada when he was a puppy, that he doesn’t self-identify as a dog. Rather, he identifies as . . . a beaver. “I’m from Canada, eh!” he seems to say. We’ve tried to point out to him that beavers have flat tails. He has only a stub of a tail. We try to point out to him that beaver gnawing teeth are strong flat incisors. Lefty has large canines. The facts of his biology have little interest to him. He just wants to chew on trees! Is it confusion? Or is it destiny? You may wonder, why am I outing Lefty like this? What business is it of mine to tell the world about his dendritic preference? Who needs to know that, while most dogs gnaw on bones, my dog gnaws on trees? The question is very human-centric. I mean, have you ever paid attention to a dog? They don’t have any sense of privacy. They pee and poop in public. They hump in public. They’ve been on Facebook since the beginning. You can’t out a dog because a dog has never been in. Lefty has been very public about his beaver-like behavior. Just follow us around when we walk this puppy and you’ll see. ← Why Are Belligerent Policies Assumed to Be Successful?